Flossie continues westward toward the Big Island of Hawaii. The effects of rain and wind will pick up late tonight into Monday. It is very difficult for a tropical storm to affect Hawaii approaching from the east. Satellite imagery shows dry air to the southeast of the circulation. Deep convection is also limited to near and to the north and west of the circulation. I personally don't believe that sustained winds are at 60 mph. A 60 mph tropical storm should have gusts to near 70-75 mph which seems a stretch. There very high terrain will likely see tropical storm winds Monday with heavy rainfall. The resort areas on the coast will see some winds gusting to tropical storm strength (40 mph). 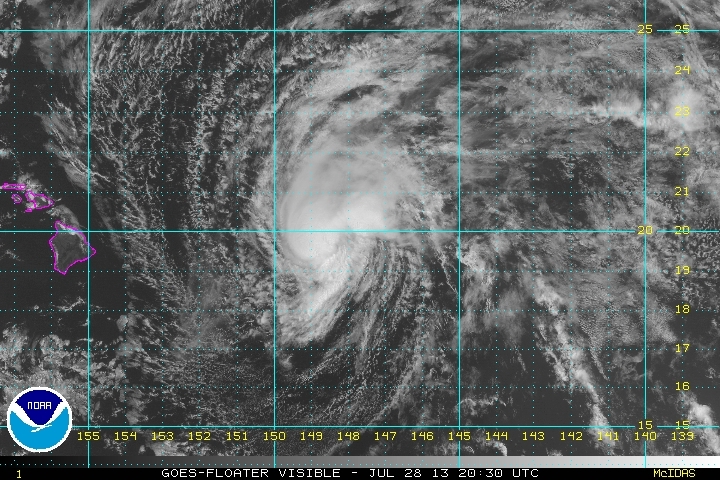 As of 11 am hst Flossie was centered near 19.9 N / 148.5 W or about 430 miles east of Hilo, Hawaii. Movement is west at 20 mph. Top sustained winds are estimated at 50 mph (NHC 60 mph / 11am hst or 5 pm edt advisory). Pressure is estimated at 999 mb. Flossie will cross the Big Island of Hawaii Monday and pass just south of Maui a little later in the day. It should stay about 100 miles south of Oahu. The biggest concern will be very heavy rainfall of 10+ inches on the windward slopes. High surf may also bring water over coastal roads on the Big Island and Maui. Flossie continues to weaken. The remaining deep convection is on the southeastern edge of the circulation. There will be some heavy showers and gusty winds as Flossie moves through the Islands later today and tonight. This in not a big concern. As of 5 am hst edt Flossie was centered near 20.5 N / 153.5 W or about 120 miles east northeast of Hilo, Hawaii. Movement is nw at 16 mph. Top sustained winds are estimated at 45 mph (NHC 45 mph / 5 am hst or 11 am edt advisory). Pressure is estimated at 1000 mb. Flossie's track is shifted north slightly. It will now pass a little north of the Big Island and move through the Islands today and tonight. Rainfall will be locally heavy and winds may gust to tropical storm force at the resort areas. Flossie is moving farther north than expected the low center will pass north of the Islands. 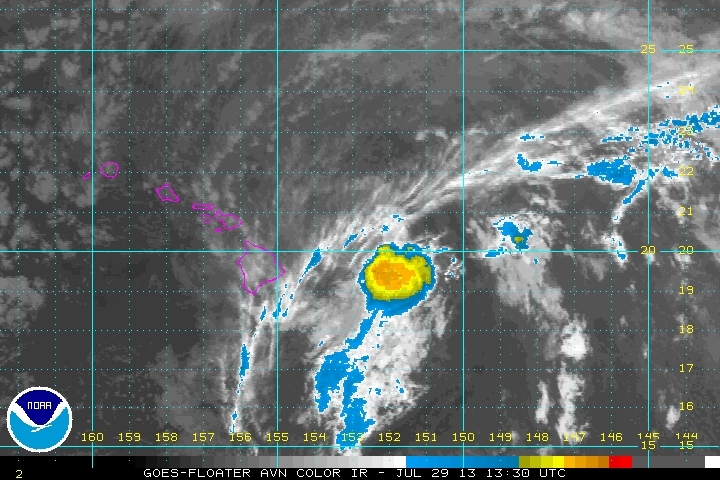 As of 11am hst edt Flossie was centered near 20.7 N / 154.8 W or about 75 miles north of Hilo, Hawaii. Movement is nw at 15 mph. Top sustained winds are estimated at 35 mph (NHC 40 mph / 8 am hst or 2 pm edt advisory). Pressure is estimated at 1000 mb. Flossie's track is shifted north slightly again. It will now pass a little north of the Islands today and tonight. Rainfall will be locally heavy and winds may gust to 30-35 mph at the resort areas. 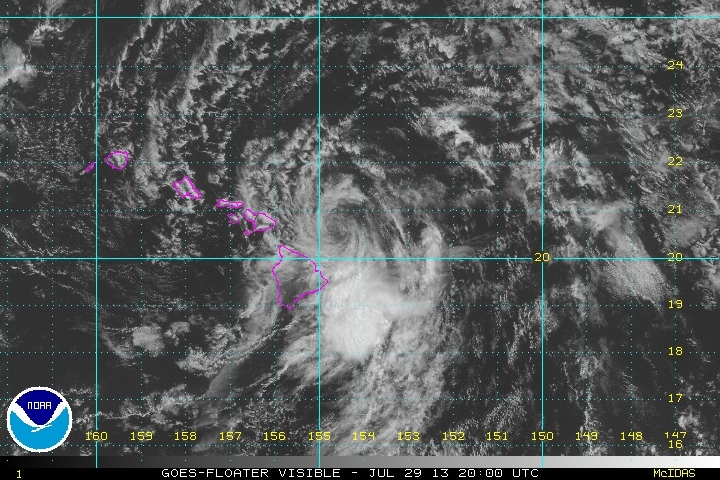 Tropical depression Flossie is moving just north of northwestern Hawaii. The strongest gust at official reporting stations was 43 mph at Kahului. Most locations saw gusts 20-30 mph as Flossie passed. Rainfall was also very scattered. Honolulu saw a heavy shower that produced less than 1/4" of rainfall.